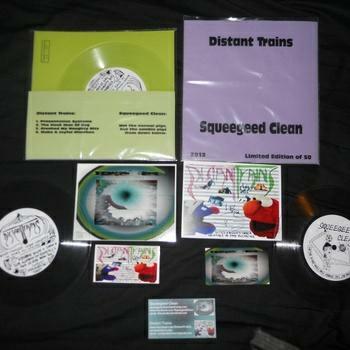 A couple years ago I reviewed two CDs by Squeegeed Clean, an Australian Avant-Jazz inspired Psychedelia-in-Space combo led by the duo of Funkmeister G and D.J. Urinal Cake, a couple of rascals whose exploits I’ve been following since I started receiving submissions in the early Aural Innovations days by their band Vocabularinist. Their latest is a 7″ split single with Distant Trains, a solo project, and apparently only the latest of many, from Des Moines, IA based Chuck Hoffman. The single is available on clear vinyl in an edition of only 50. The Squeegeed Clean side consists of one 4 minute track, Not the normal pigs, but the zombie pigs from down below. How’s that for a title? This is raw edged psychedelic free-jazz with blaring horns, tribal percussion and weird effects, like the results of a Sun Ra master class for creative hometapers. To get a more detailed description of what these guys are about, CLICK HERE to read my review of their first two full length CDs. The Distant Trains side consists of 3 tracks, adding up to nearly 5 minutes. Hoffman starts off by taking an old time educational film voice sample and backing it with grungy metal guitar and drums. This is followed by completely whacky cartoonish music, like John Zorn dropping acid and scoring new music for old Hanna-Barbera toons. Hoffman seems to do another 180 degree turn, transitioning to a stoned, noisy metal dirge, only to launch right back into the freaked out cartoon music. Lots of fun in less than 5 minutes!